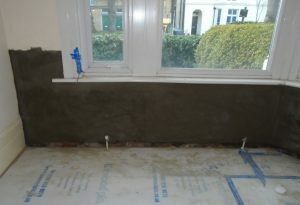 This job was for treatment of rising damp within a semi-detached house in Northwood. Following our clients intention to purchase this home, they had a homebuyers survey conducted. This report flagged up a problem with dampness within the front wall. Rising damp doesn’t always have obvious visible signs, it is possible to live in a home for years and be unaware of a problem, however left untreated can cause decay to the adjacent timbers in contact. Once a problem has been diagnosed however, it is always recommended that it be treated as soon as possible. This is due to the fact that the longer it is left the worse it can become and in turn more costly to rectify. Kenwood have installed a new chemical damp proof course by injecting the brickwork. The walls have been replastered with waterproof plaster and will be skim finished ready for redecoration. With our twenty year guarantee out client and the subsequent owner can rest assured Kenwood have created and damp free space for them.